Weather has not been good this year for swimming, so it was our first day at the local city pool. I took two grandchildren, Jaiden and Wyatt. At first the pool was wall-to-wall people, but mid-afternoon, two school buses picked up many of the swimmers. Then, the crowds thinned. We had been there a couple hours when Jaiden and Wyatt were playing under a water feature that fills buckets with water, then dumps the water on anyone standing underneath. Wyatt stood under a bucket with his head up and mouth open. Immediately after the water dumped, both Jaiden and I noticed blood streaming down from Wyatt’s mouth. Jaiden told him to come to me as I was also indicating that he should come to me. I grabbed a beach towel and we headed toward the First Aid station. 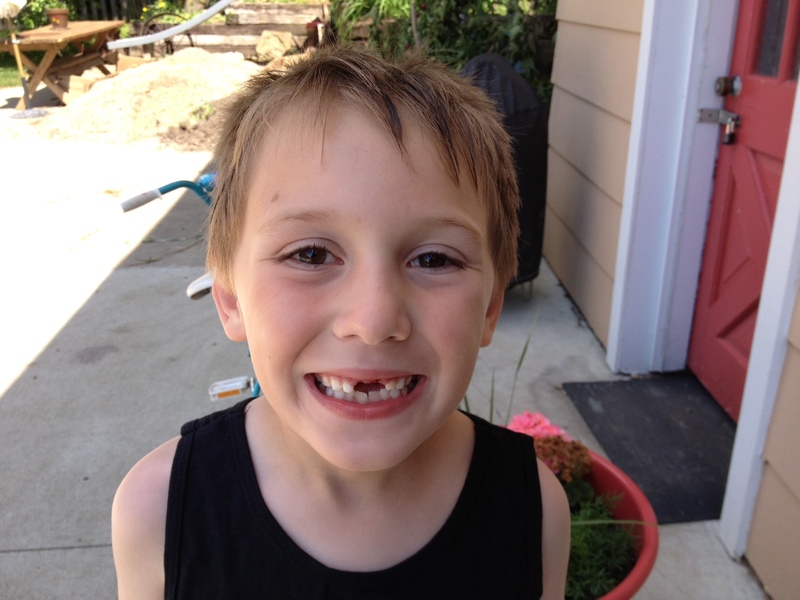 We already knew that Wyatt had lost one tooth the previous day, and another one was very loose. The young First Aid attendant was already helping someone with a bloody nose, and indicated that he didn’t know anything about pulling teeth. I asked if he could just give us a piece of gauze, which he did. We stuck the gauze in Wyatt’s mouth and prepared to leave the pool. When we got to the car, I had Wyatt take the gauze out of his mouth, and there was his tooth, in the gauze! Whew! The tooth was not lost in gallons of water… the tooth fairy would find evidence of the lost tooth that night!